These circular LED displays are a lot of fun. Essentially, these are what you would get if you could 'wrap' one of our LED bargraphs around a circle. They consist of 16 blue LEDs arranged so that each quarter of the circle has a common ground and four anode pins, resulting in 20 pins total on the device. 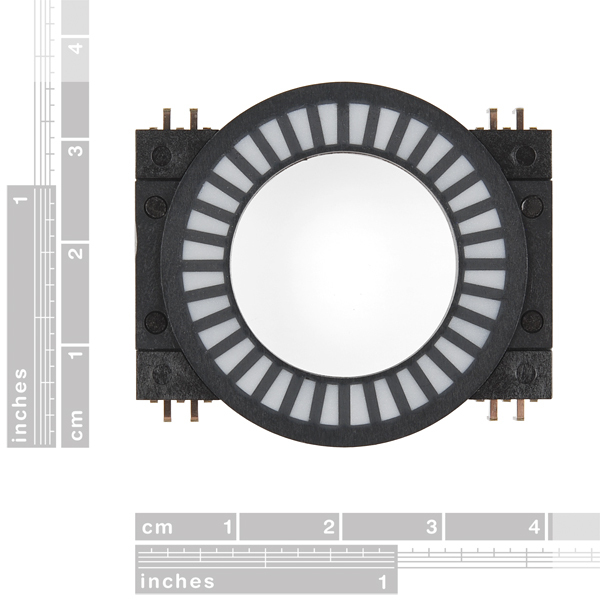 Because they're simply a bunch of cleverly packaged LEDs, they're just as easy to use as our LED bargraphs. These are great for indicating the position of a rotary encoder! I feel like I've been cheated. I bought two of these in blue and two in red in January, and didn't discover until they arrived that they have a completely useless pinout if you're restricted to 0.1" grids... and this weekend I learned that the breakout boards are discontinued. I don't have the facilities to use the Eagle files or anything else to have custom PC boards made, so I've got $40 worth of hardware I cannot use. Why on earth would you continue selling these without putting on the description above BREAKOUT BOARD NO LONGER AVAILABLE? Hi there, I am thinking of picking a couple of these up, but I can't find the red board as shown in the last picture. Can someone point me towards it? It's actually been retired from our catalog, but if you'd like to reference the datasheets (or use the Eagle files to build your own version), you can find all of that here. OKay, thanks, but it seems weird to me that you have about 800 red and blue combined of these, but you retired the red board that allows you to use this product?? Would be nice if the serial data output pin on the second shift register was broken out so the board could be daisy chained with other shift registers. One can solder a jumper wire to the pin on the chip itself in order to do this fairly easily, but it would still be nice to have a pin on the board to accomplish the same thing. How you would use this with a front panel for a project? 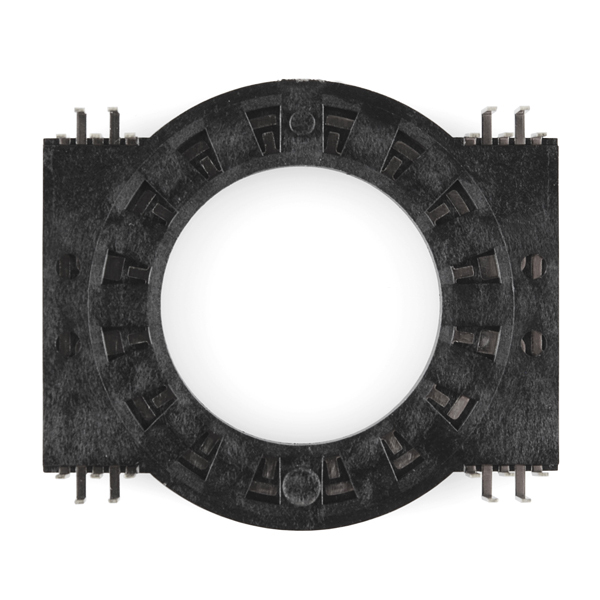 Would you cut out a circle to show the ring and have the slightly raised circular plastic set beneath the panel? It seems you'd be stuck then having the potentiometer completely exposed like on that red board. I really like the idea, but I'm having trouble thinking how to use this in a finished way. 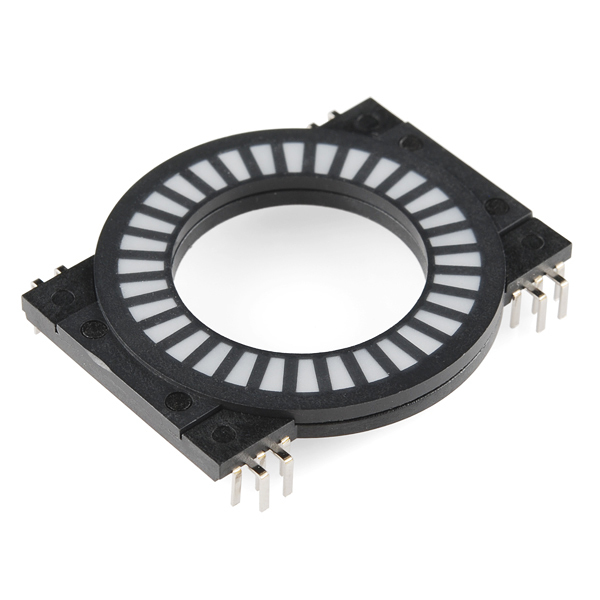 It would be great to have a combo of the RGB encoder and the ring LEDs but with a finished center, so that you couldn't see the business end of the encoder. Hmm, or maybe 3d print a black cap for the center that snaps onto the open spaces on the edges of the encoder? Also, the last photo shows the little breakout board to mount this and the rotary encoder. Is this a purchasable part? Or does it come with the circular LEDs? This would be an even better product if the colours went from red to green! Any chance of this? Or is it possible to replace the existing LEDs for custom colours? is it possible to replace the existing LEDs for custom colours? Not really - it's not discrete LED components underneath the segments, but dies and bonds straight onto the board. This would be an even better product if the colours went from red to green! Any chance of this? 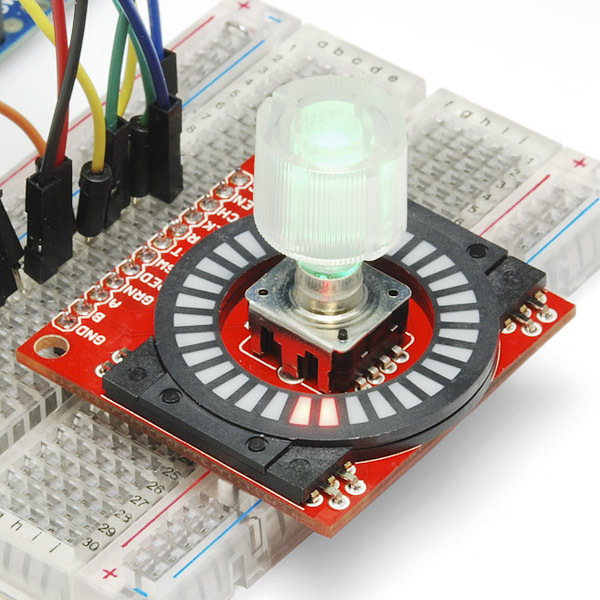 Alternatively, you could check out the Rotary Encoder LED Ring Breakout Boards. Those do use discrete LED components that you could swap out. How good of a Arc Reactor would this make? I'm assuming you mean the chest piece. It would make for a very small one; check the image with the rulers. You'd also have to add appropriate masking to get the design of arc reactor you'd be after (Mark II has 10 sections, for example - you could only get 8 disparate sections with this bar graph, so instead you'd have to light all 16 up and block unwanted areas instead). Haha, I can always trust people on Sparkfun to give me a logical answer. I was mostly kidding, although I was thinking about making one with Arduino Lilly pad components. I just received a blue one. It has 32 leds and they seem to light up in pairs. A common anode version would be more interesting so I could drive it with a shift register. Still, I really like it when you come up with products like this. Keep up the good work. It has 16 LEDs, as you can read in the description and on the mechanical drawing. It's just that each LED has 2 windows. A pity, I would have loved a 32 LEDs version. You should still be able to drive it with a shift register (see the RingCoder breakout below); you'll just need to drive the register output to the opposite state. I see a direction indicator for a homebrew antenna rotor coming up.